In this episode of Street Sign Language Lesson, we examine two lost cat posters, learn what a fessura is, and get the low down on what to and what not do in the public swimming pool. Left: Former board school (convitto) sign on via Pignolo, Bergamo. 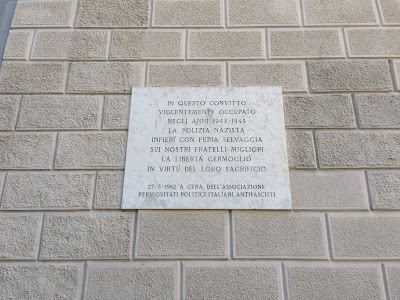 Right: Information about the fascist occupation of the school. 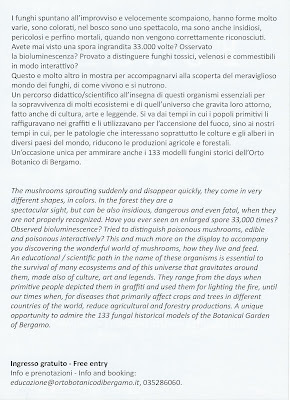 The place where we live, via Pignolo, reveals its secrets bit by bit. During one of our morning coffee-talk sessions at Caffè Papavero, we learned that the current University of Bergamo building at Pignolo 123 was once a boarding school. 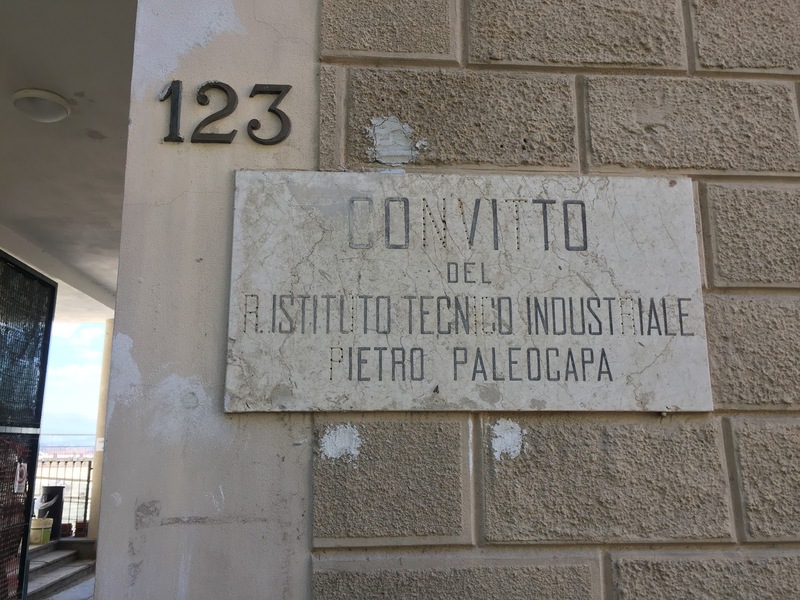 When we walked up the street later, indeed we saw a sign explaining a little of the history of the building: Convitto – del r. Istituto Tecnico Industriale Pietro Paleocarpa. Pietro Paleocapa (1788 – 1869) was an engineer, scientist, and politician born in Bergamo. For the record – and because I’ve made this mistake too many times – his surname is pronounced as “pale ee OH cappa” not “paleo CAPpa”. 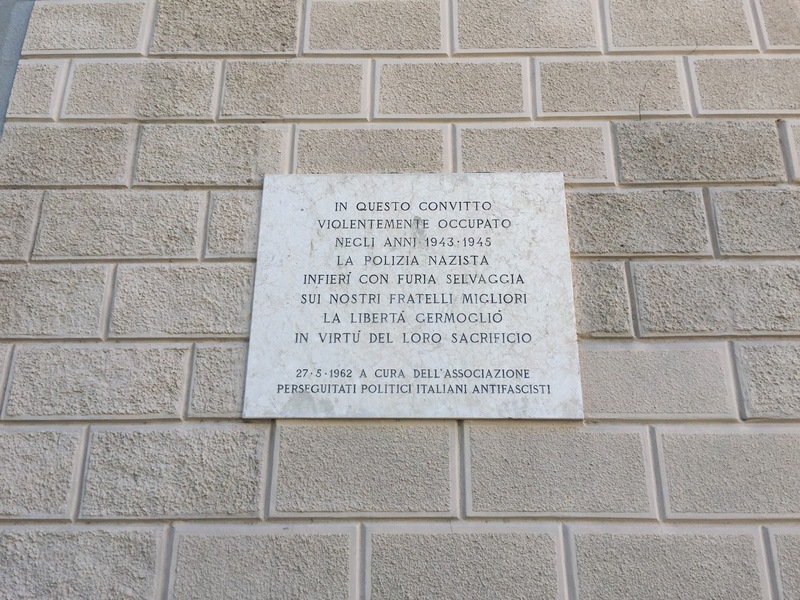 In questo convitto violentemente occupato negli anni 1943-1945 la polizia nazista infierì con furia selvaggia sui nostri fratelli migliori la libertà germogliò in virtù del loro sacrificio. In this boarding school, violently occupied in the years 1943-1945, Nazi police acted savagely towards our good brothers. Freedom sprang by virtue of their sacrifice. There are two uses of passato remoto in this text: infierì (inferire) and germogliò (germogliare). The passato remoto conveys distance in time, adding emotional weight to the subject matter compared to using the passato prossimo. And the passato remoto is shorter to use: less space on the sign I suppose is a good thing. Left: Funicolare San Vigilio. 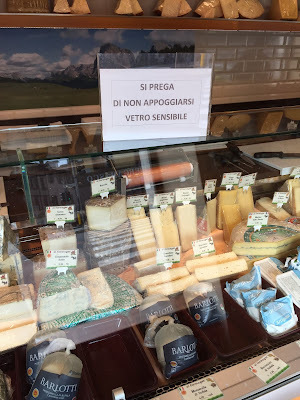 Right: Cheese window at Ol Fromager, Bergamo. 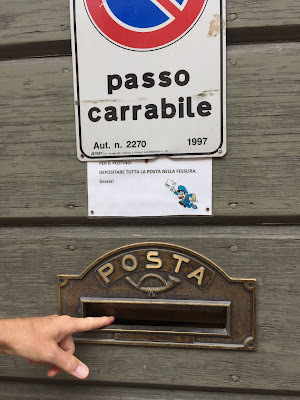 We were ambling up via S. Vigilio one day on our way up to Castello di San Vigilio and we saw this sign on a side street. 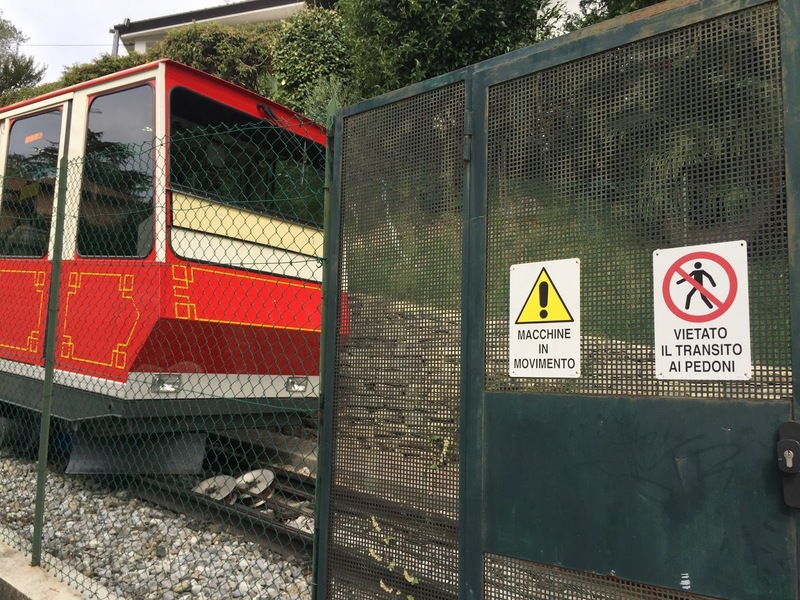 The photo shows the sign with the Funicolare San Vigilio in the background. There are two funiculars in Bergamo. 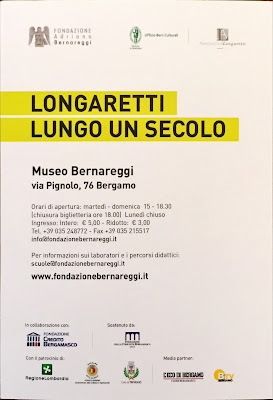 One from Bergamo Bassa to Bergamo Alta called the Funicolare di Bergamo Alta, and the San Vigilio funicular which takes you from Bergamo Alta to Castello di San Vigilio. This sign was at Ol Fromager, a cheese shop located a few minutes from our apartment. The cheeses look so good that you can’t help but put your face up to the glass. But this glass display is sensibile – sensitive in the physical sense, not sensible as in practical. Si prega di is a formal way to say please. 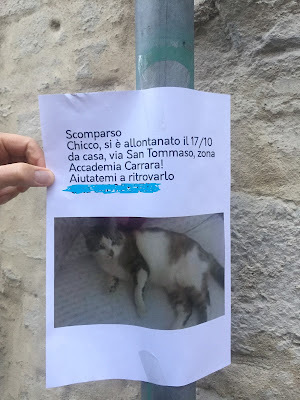 Informally, you could use per favore. 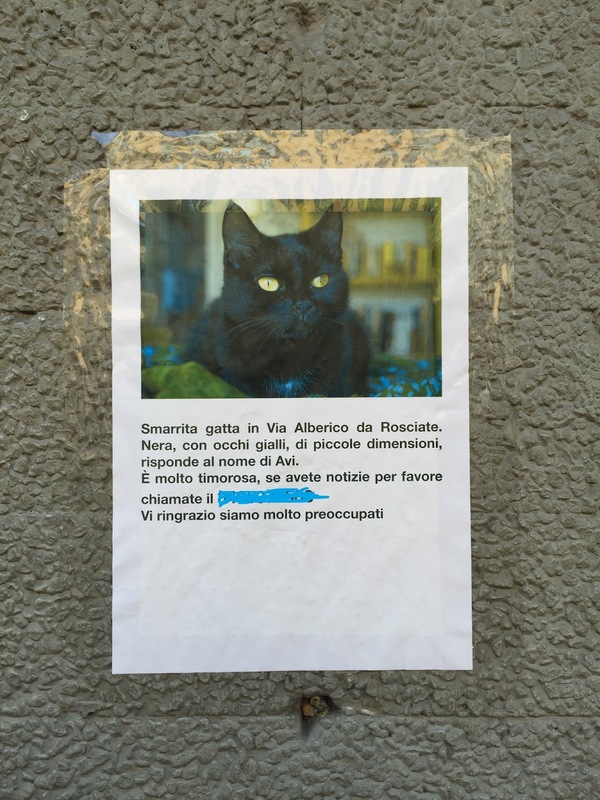 Left and center: Lost cat signs in Bergamo. Right: Postal opening on a door (fessura). 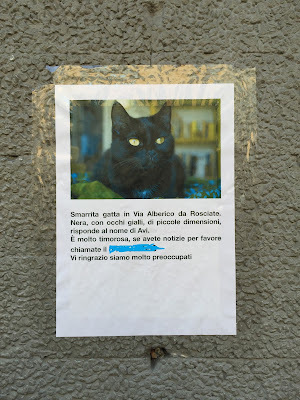 They are just lost cat posters, but are the kind of thing that stops me in my tracks and sets me to wondering about the words used. What if I lost my cat, what words would I use? Smarrita is an adjective which comes from the verb smarrire, to lose or misplace. Scomparso is an adjective which comes from the verb scomparire, to disappear or vanish. Where the adjective goes is one of those areas of Italian grammar that I never seem to get right. When I first started with the Italian language, I learned that adjectives follow a noun. Later, I learned that this isn't always the case, and that, adjectives can come before a noun. Adjectives following a noun restrict or further qualify the noun. Adjectives preceding a noun describe or give another sense or valuation to the noun. A classic example is: mio vecchio amico versus mio amico vecchio. The former is my old friend that I’ve known for a long time. The latter is my friend who is old. You could go either way with the adjectives for the cats. For example, smarrita gatta sounds to me like the cat lost itself, while gatta smarrita is more like the owner lost the cat. Here’s hoping Avi (gatta) and Chicco (gatto) made it home. I always think this word sounds dirty, but it is quite innocent. It means crack or fissure. The sign posted on this door reads: Per il postino: depositare tutta la posta nella fessura – For the postman: put all the mail in the mail slot (or opening). Left and center: Signs at the Centro Sportivo Italcementi in Bergamo. 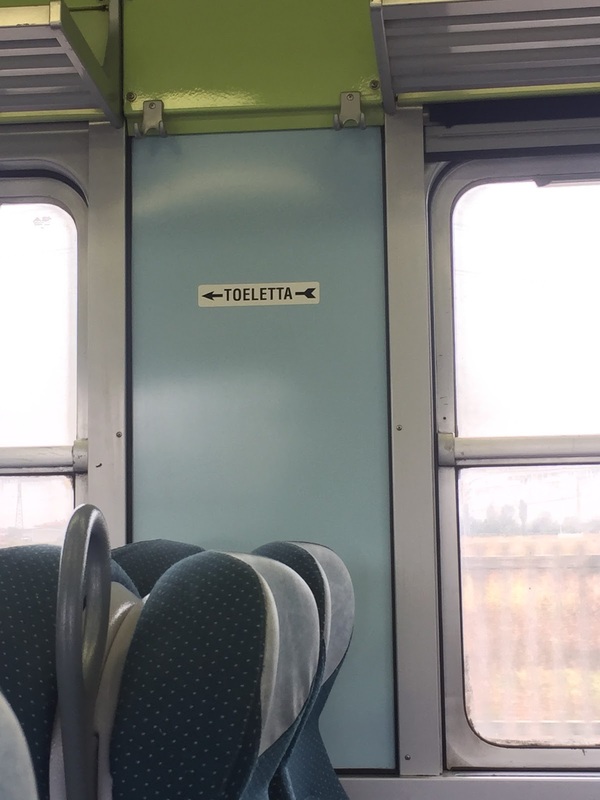 Right: Toilet sign on a train. 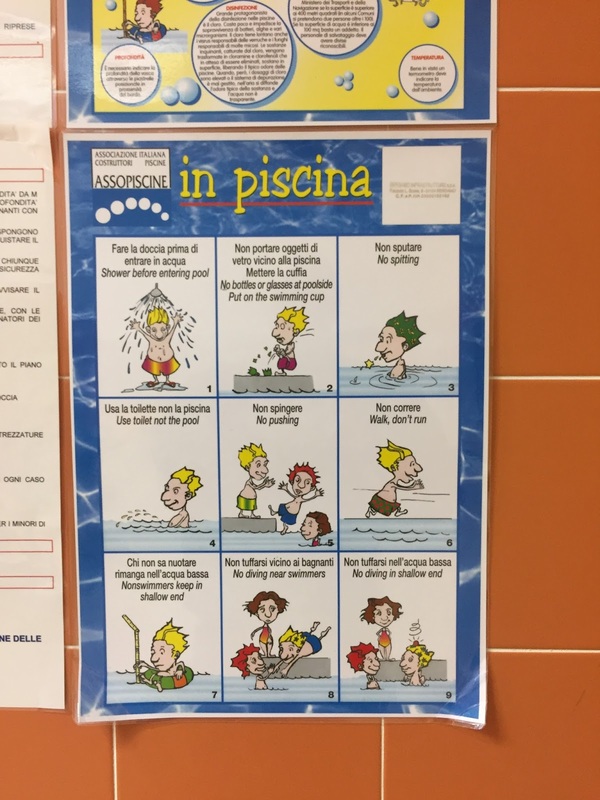 We went swimming at the Centro Sportivo Italcementi, and oh boy, new signs. This one is pretty straight forward. You have to immediately take your shoes off when you enter the locker room. 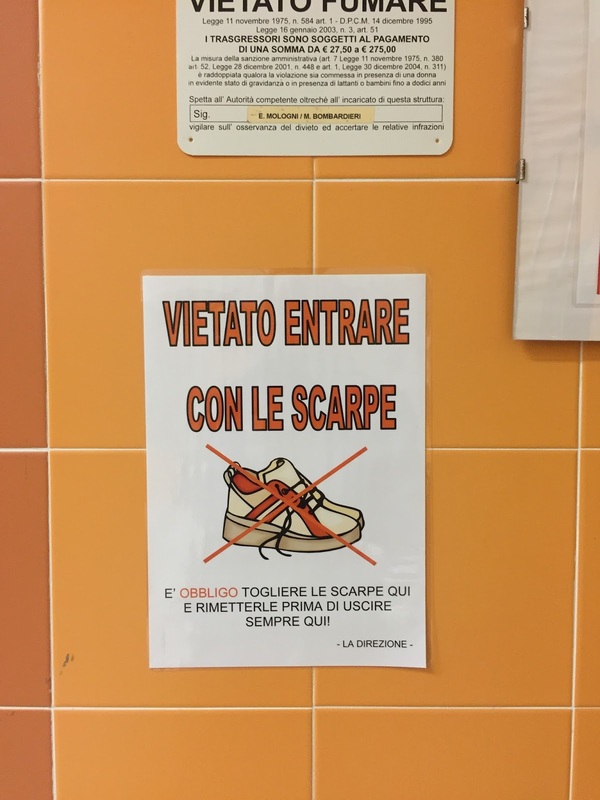 The sign continues emphatically: è obbligo togliere le scarpe qui e rimetterle prima di uscire sempre qui! – you must remove your shoes here and put them back on, always here before leaving! Interesting words in the rules include: la cuffia (in this context it means swimming cap), tuffarsi (to dive), nuotare (to swim), and sputare (to spit). Also, note the common use of the verb sapere fare qualcosa (to know how to do something), in this case sapere nuotare. 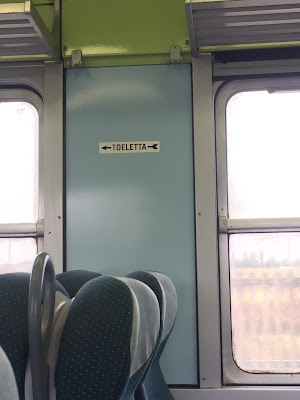 Speaking of toilette, on the train from Bergamo to Milano, this little sign caught my eye. It's a sign pointing to the toilet or bathroom. At first, I thought toelette was misspelled, but later realized it is correct. It's sort of a classy (and maybe outdated) way of saying bathroom. Left and center left: Flyer for the Longaretti Exhibition. 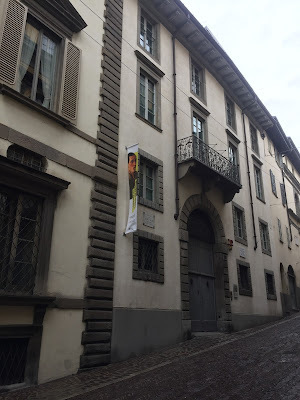 Center right: Outside the Museo Bernareggi. 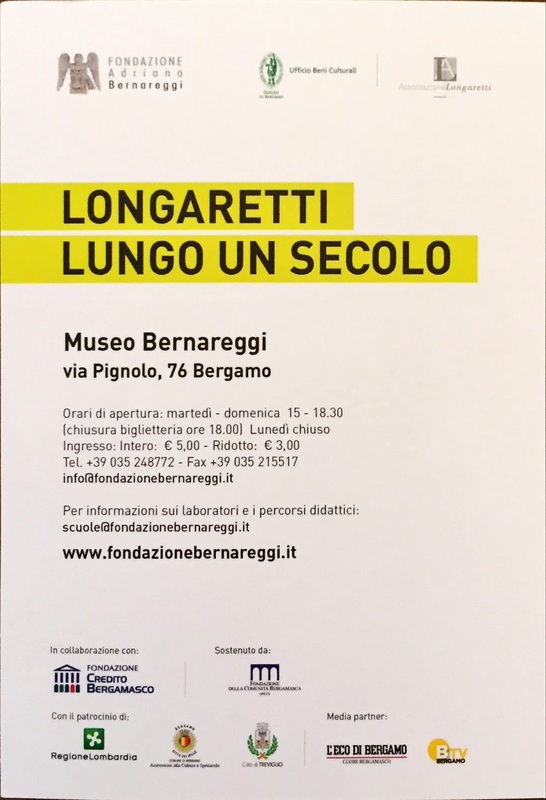 Right: The Longaretti Exhibition inside the Museo Bernareggi. 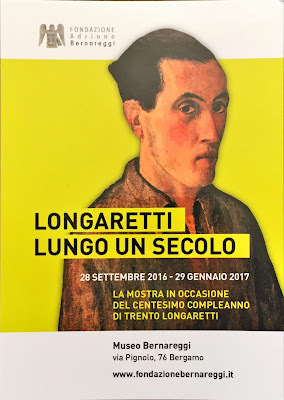 The Italian painter Trento Longaretti, born in 1916, just celebrated his 100th birthday (hence lungo un secolo). 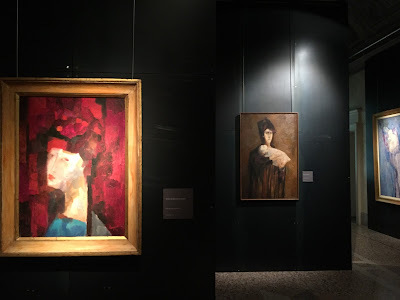 We stopped by the Museo Bernareggi to see his retrospective (September 28, 2016 to January 29, 2017), and were quite impressed. Left and center: Flyer for the Mushroom Exhibition. 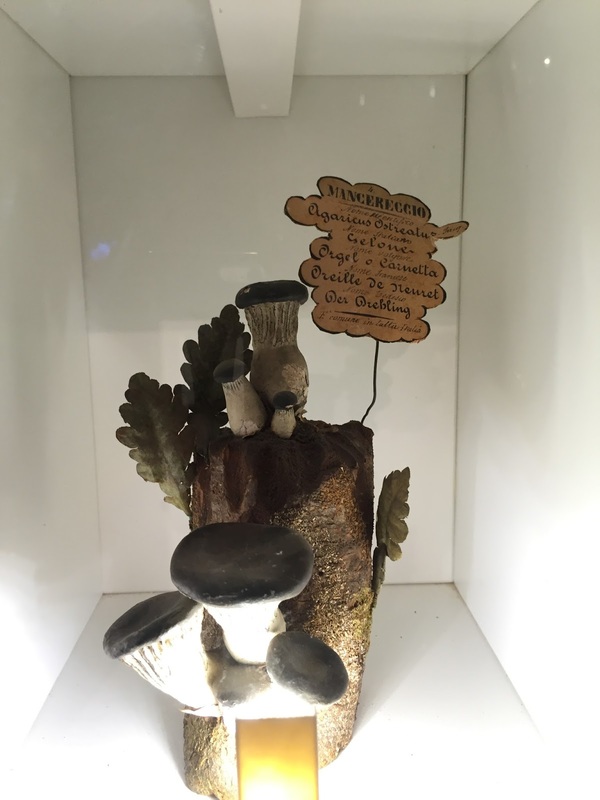 Right: Example mushroom model. 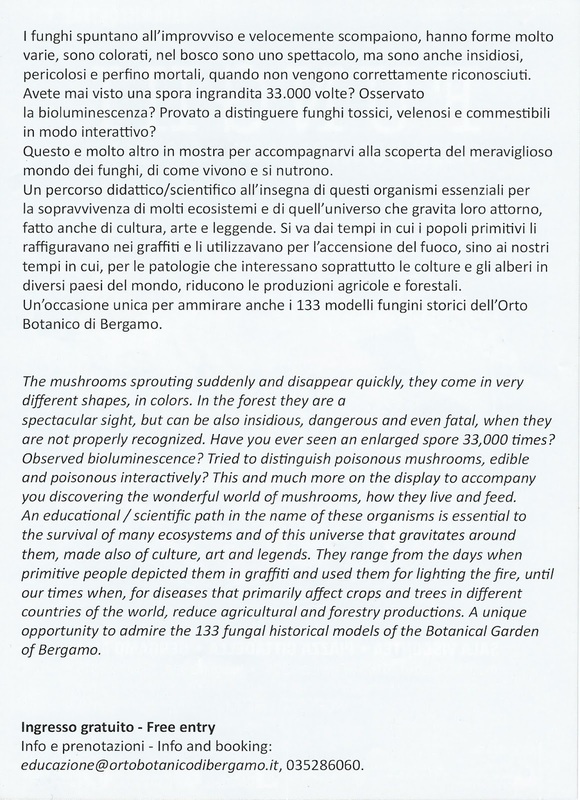 The Sala Viscontea in Bergamo Alta hosts interesting plant-oriented exhibits. Early this year, there was Seduction Repulsion: What Plants Don’t Say. This time around we have mushrooms. As usual, it’s free to enter and the exhibit is choc-full of information, including some cool historical mushroom models (really, they are interesting). Definitely worth a visit or two. 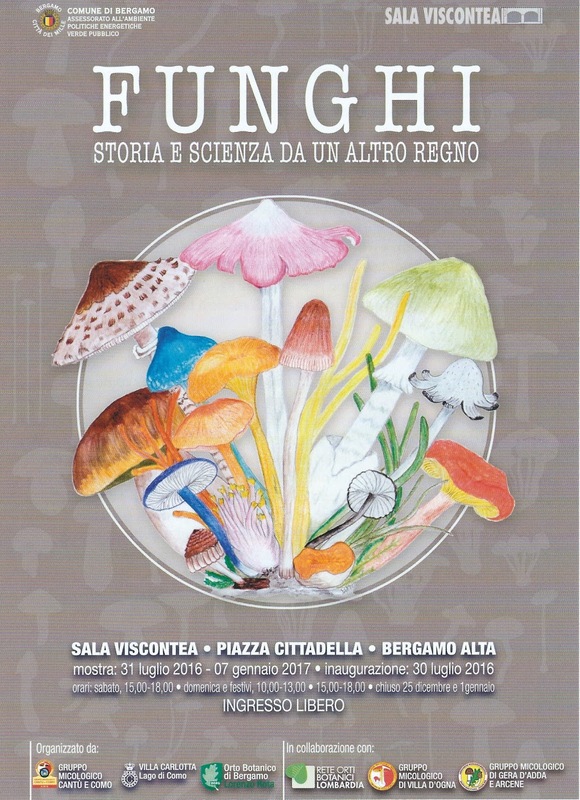 In the photo of one of the mushroom models, the word mangereccio, or edible, can be seen. The word derives from the verb to eat, mangiare. You could also say edible using commestibile.